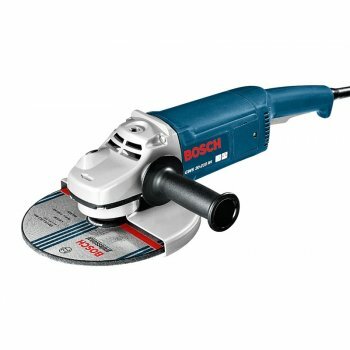 Bosch GWS 20-230 9in Grinder has a powerful 2,000 Watt motor and it light weight with a straight handle that is easy to handle. Vibration is reduced by upto 50% due to the soft grip Vibration Control main handle and auxiliary handle, for low-fatigue working (EN 60745). 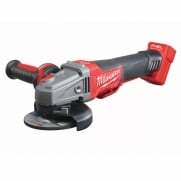 Fitted with KickBack Stop, that detects when the disc is jammed and shuts down the tool immediately and restart protection that prevents the tool from automatically restarting after a power cut, for added user safety. 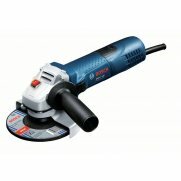 The anti-rotation protective guard with quick adjustment, reliably protects the user if the grinding disc breaks. It has a starting current limitation and soft start of the machine. The armoured coils protect the motor against sharp grinding dust, ensuring a long lifetime. 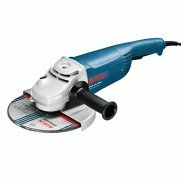 Specification Input Power: 2,000 Watt.No Load Speed: 6,600/min.Grinding Spindle Thread: M14.Disc Diameter: 230mm.Weight: 5.1kg. Noise/Vibration Information Measured values determined according to EN 60745. Total vibration values (vector sum of three directions). Sanding with Sanding Sheet: Vibration Emission Value ah: 3.5 m/s².Uncertainty K: 1.5 m/s². Surface grinding (roughing):Vibration Emission Value ah: 5.5 m/s².Uncertainty K: 1.5 m/s².